Be the first to share your favorite memory, photo or story of Crescentia . This memorial page is dedicated for family, friends and future generations to celebrate the life of their loved one. 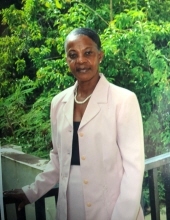 Relatives and friends are advised of the passing of Crescentia Abraham better known as Bezo of Ravine Banane in Grand-Bay, who passed away on September 17, 2018 in St. Thomas at the age of 70. Nikkima Fregiste, Jahshy & Christina Leonard, Ke’Lahni Abraham, Tyrell Reid of USA, Iroy & Kayambe Alexander in Guadeloupe, Lindell Elizee in France, Secanda Joseph in England, Mehandad Joseph in Dominca, Shaltu Bruney in St. Thomas , Daniyyel Wattley in Tortola. Relatives and friends are respectfully invited to attend first viewing that will be held on Thursday October 4, 2018 5pm – 7pm at Celestial Chapel of Hurley Funeral Home. Second viewing will be held on Friday October 5, 2018 at Holy Family Church 9:00am – 10:00am with Mass immediately following at 10:00am. To plant a tree in memory of Crescentia B. Abraham, please visit our Tribute Store. "Email Address" would like to share the life celebration of Crescentia B. Abraham. Click on the "link" to go to share a favorite memory or leave a condolence message for the family.